In 2005, during the winter months of June and July, the group took time-lapse images at a rate of 25 frames per second of two Emperor penguin colonies located at Pointe Geologie and Atka Bay in Antarctica. While average wind speeds reached 14 meters per second and air temperatures ranged from a bone-chilling -33 to a soul-crushing -43 degrees Celsius, the temperatures toward the middle of the penguin huddles could reach up to 37 degrees Celsius. So, spending time at or near the center is important for penguins and their young to avoid the icy licks of winter wind, albeit temporarily. And waves act to reorganize the huddle that then allows penguins on the outskirts to move further into the huddle. 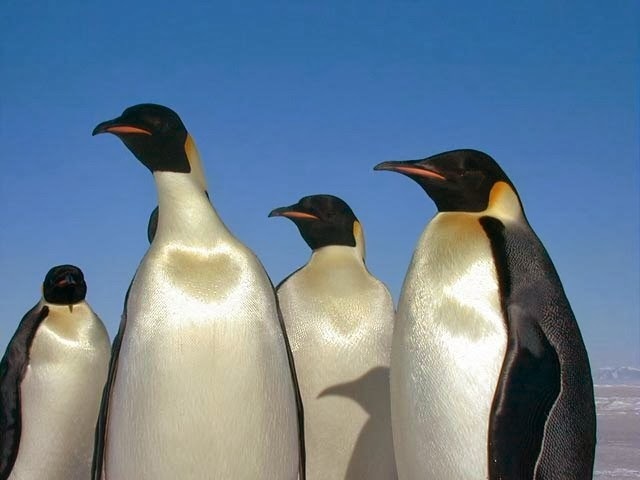 By adapting equations of motion that predict traffic jams, the group created a model that can replicate the wave motion throughout a huddle of Emperor penguins. The key difference between a penguin huddle and a traffic jam is the direction that waves travel. In a traffic jam, cars can only move in a forward direction, restricting the wave’s motion to one direction. But in a penguin huddle, penguins can move left, right, forwards, backwards or diagonal, which means the consequential waves can propagate in any direction, too. The video depicts this versatility. From their model, the group concluded that any single penguin could trigger a wave. Occasionally, a penguin will perform a step, the authors explained. After a short period of time, neighboring penguins will also move. This time delay that can predict wave velocity, depends on the physical distance between penguins, speed of each penguin’s steps and threshold distance, which is the necessary distance between penguins that is close enough to coax a penguin to move with the others but also large enough to give the penguin room to move. The group’s model shows a trend between wave velocity and threshold distance: smaller threshold distances should trigger faster waves. The wave speed that the group measured from their time-lapse images was about 12 meters per second. When the group input values they measured from the time-lapse images for distance between penguins, threshold distance and speed of each penguin’s movement into their model, they calculated a wave speed “nearly identical” to what they observed. Moreover, the threshold distance the group measured for the Emperor penguin huddles they observed was around two centimeters – about twice the thickness of the penguins’ compressive feather layer. “This suggests that the penguins touch each other only slightly when standing in a huddle, without compressing the feather layer so as to maximize the huddle density without compromising their own insulation,” the authors stated in the paper. For more videos of the group's time-lapse images and models see the paper's supplementary material. freeze a jolly good fellow ..